Call it licking our wounds, making a silk purse out of a sow’s ear, or the silver lining to the storm cloud, we took refuge in a trip to the Cinque Terre in place of our long-planned-recently-aborted trip to the U.S. In October of 2010, 2012, and 2013, we made sojourns to the Cinque Terre, but 2014 was to be the 2+ week trip to America to see friends and family, as well as attend our nephew’s wedding. We would skip the almost-annual fall hiking trip. 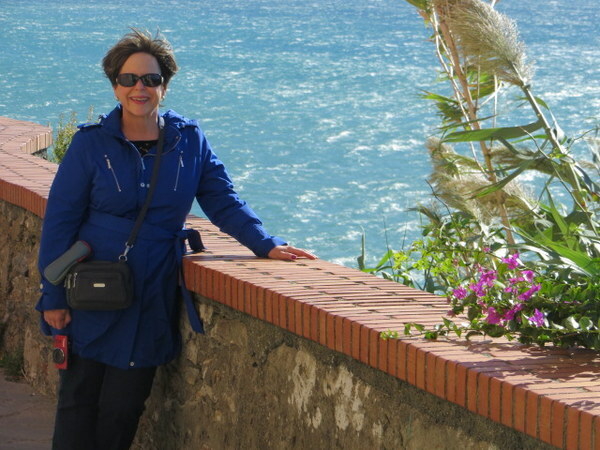 Since we could not go to the U.S., and since the weather in October was not only holding steady in Rome but improving in the north, we found a last minute rental in Manarola and headed out last Wednesday, with promise of sun and moderate temps. Wind-whipped day on the Belvedere, Manarola, Cinque Terre, Italy. We were not alone: the hoards have not let up their hold on the cute little villages. First clue was the mobbed train from La Spezia to Manarola on a Wednesday. The sea was rough so the boats that relieve train congestion did not run, making the train all the more fun. Luckily we had only an 11 minute train ride as we had to stand in the vestibule of the train as it chugged through the tunnels. In Manarola we found Andrea waiting as promised to lead us to our apartment. What providence for both of us! For Andrea to have a five night end-of-season rental, and for us to find such a great place that met or exceeded all of our criteria: Less than 100 Euro per night, WIFI, clothes washer, view of the sea, less than 50 stairs to climb, and a place to make coffee in the morning before the bars open. (I added the 50 stairs criteria after a couple of trips where we had 70 or 80 stairs to climb each time we came-and-went from our room or apartment and we decided we prefer spending our energy hiking or exploring a city, not in climbing to and from our lodging.) Andrea’s place is a large one bedroom with two matrimonial beds, and the possibility of renting two additional bedrooms one level down. Could be great for a large family. People complain that the Cinque Terre is too crowded and touristy. It does seem these little villages are loved a bit too much by non-Italians. Interestingly, the majority of travelers here right now are French, German, Australian, and British. We have run into very few North Americans. While the five villages are cheek-by-jowl with tourists during the daytime, evenings are serene, restaurants can accommodate those of us staying the night, and we have once again found places to venture where few of those passing through bother to tread. Instead of the famous Sentiero Azzuro between the towns, we headed up up up to Il Santuario di Nostra Signora di Reggio (The Sanctuary of Our Lady of Reggio). We saw one person at the top, and four on the way down. A far cry from the masses on the coastal trail. Click on any picture for a slide show. Vineyards and olive groves dot the landscape. How they built churches up here in the 13th century, I’ll never understand. A lone hiker enjoys a picnic high above the Ligurian Sea at the sanctuary. Ric as we ascend from sea level to the sanctuary at 317 m (1040 ft). The Sanctuary of Our Lady of Reggio. Punto di Ristoro at the Santuario. Honor system for drinks, snacks and even a fancy make-your-own espresso. Hey, it’s Italy! We also headed to Portovenere, which has been on our list for the past three visits. The best way to Portovenere is by ferry, and when the wind is up they do not run. Friday there was a nationwide train strike from 09:00-17:00, so it seemed like a perfect day for a boat trip. We heard nothing but Italian and German in Portovenere. That is to say the tourists were European, not North American, for the most part. It is a fascinating little city with 2600 years of history. The Romans had huge influence, of course. There is a castle, a cemetery with a view, and the lovely Church of San Lorenzo, complete with fresco of his gruesome martyrdom. Returning to our little base in Manarola we could not believe how teaming it was with people after a peaceful day in Portvenere. Approaching Portovenere from the sea. Imagine how formidable this fortress would look to invaders? Portovenere from the dock. The colorful palazzi were part of the castle defense as well, a solid wall easy to defend. View from high above Portovenere across the calm Gulf of the Poets, with the Appenine mountains in the background. The little alley-like streets in Liguria are called “caruggi.” Here is one softened by a variety of plants. Quiet commercial “caruggi” in Portovenere. No crowds here on a sunny October Friday! View from a Gothic window in the “old” part of San Pietro Church, Portovenere. The very old Chiesa di San Lorenzo in Portovenere. The cemetery and mausoleum above Portovenere. Prime real estate. Another bucket-list location for us in Liguria was Camogli. I wanted to do the hike from there to the Abbey at San Fruttuoso. Alas, it will remain on the bucket list as the weather report for the planned excursion day showed temps barely above freezing and light rain. We are not sure if the weather report we pulled up was wrong, but we dared not take the chance on a 75 minute one way train trip to find we could not hike. So we headed to La Spezia, which is “the big city” in these parts. Only 11 minutes from Manarola by train, it is of a decidedly different character, but has some redeemable charms. There is an excellent Naval Museum, a beautiful waterfront passeggiata, and a significant pedestrian shopping area no doubt designed to attract the cruise ship visitors that spend the day there. All-in-all we had a good city hike, logging almost 16,000 steps on the pedometer. Lovely “passeggiata” along the waterfront at La Spezia. Naval Museum at La Spezia with amazing models, ships figureheads, cannons, and Marconi’s (native son!) early equipment. Our final day was spent repeating a hike we took two years ago, a hike that gave us some problems at that time. We took a little bio-diesel bus from Manarola up to the tinier hillside village of Volastra. From there we hiked mostly level through vineyards and forest, although our mostly level track had a precipitous drop-off. The final hour was a somewhat technical descent due to a rocky path and awkward footing. Luckily we had good hiking shoes and our walking sticks along. The special trail shoes and sticks are newly added to our gear, partially as a result of hiking this route two years ago. We had hikers on then, but not trail shoes made for this terrain. The shoes we had then tended to slip and made for some scary moments. The hiking sticks we have pooh-poohed in the past suddenly seemed like a good idea, and we adopted them as well as good trail shoes. We were very proud of ourselves for making this hike again and with proper gear. It was a hell of a workout, but we were safer for the gear. Once again, a lightly traveled route as so few people make their way to the higher trails. My charming hiking partner. Note the hiking stick. Love them! Hiking through vineyards high above the Ligurian Sea. Ric wanted to show the condition of the trail in some spots. One wrong step…. Incredibly beautiful day to hike. How hot it would be in July! High above the little town of Corniglia. Challenging descent ahead. This is the rail for the “wine train” a little monorail system allowing the farmers to harvest grapes and drive through the steep terrain. I wish I could see one in action! And so we close out a fourth trip to the Cinque Terre. I cannot imagine coming here in the summer when it is even busier, when it is hotter. It’s lovely to be recognized in restaurants that are not completely slammed, to have servers take their time and be able to linger a bit, to get an off-season rate on an apartment. We would have preferred to be in the U.S. as originally planned as we will not be able to make that trip now for several months, but we found this a nice way heal our disappointment. Every day started cool enough for a jacket, but by late morning we were down to t-shirts. Boats in the street, Manarola. Love the boat parking, but then there are no cars. The view from the Belvedere at Manarola, Monterosso al Mare in the distance. Laurel – I haven’t visited your blog in too long and was so excited to read your “The Silver Lining Trip” post. Thanks in large part to your recommendations on the RS forum, I stayed in Manarola in May! I took the same hike you described (without the safety of appropriate hiking gear) and it was one of the many highlights of my trip. I also took a day trip to Portovenere and loved it – I have some of the same photos as you took. Camogli is also on my list for a return visit to CT. My new goal is to stay in all 5 towns – 3 down, 2 to go! Thanks for helping me remember my great trip! Ciao Sharon! Glad to be of help. 🙂 We probably will not get there again until 2016 as we have so many other places we are going in 2015. We may stay in Riomaggiore or Monterosso next time for new perspective. Buone feste! Cinque terra is a fabulous place, did you see the infamous signs for the naturist beach?? Putroppo, no. It would have been too distracting for my husband. And it was a might chilly to go au natural myself. Your blogs make me feel like I’m with you. Thank you soooo much. We just spent a week in Colorado hiking and playing with Eric and his wife. It was wonderful to spend quality time with them. Thank you again for writing my favorite travel blog! Hi Nancy! Thanks for your note! You should come and play with us. Eric & his wife are welcome too!